a difference between the price the consumer is actually required to pay for a product compared to the price the consumer would be prepared to pay. 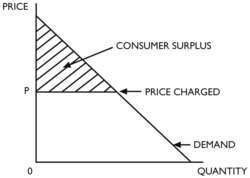 In Fig 25, which shows a downward-sloping demand curve for a product, the price charged is indicated by P. The shaded area above P represents the consumer surplus. To illustrate: you are a Manchester United Football fan; tickets for a home game are currently priced at £50 but you would be willing to pay £75. Hence you have ‘received’ as a consumer a ‘perceived benefit’ or ‘surplus’ of £25 over and above the price actually charged. Business strategists can use the concept of the consumer surplus to increase the firm's profits and COMPETITIVE ADVANTAGES over rival suppliers (see VALUE CREATED MODEL). For example, in the case of Manchester United instead of charging a single price of £50 it could segment its market, charging different prices for admission to different parts of the ground. (See PRICE DISCRIMINATION, MARKET SEGMENTATION) in order to ‘capture’ more of the consumer surplus for itself. Thus, it could continue to charge the ‘basic’ price of £50 for admission to certain parts of the ground; £75 for seating in the main stand and £120 for an ‘executive box’ seat. Similarly, BSkyB the television broadcaster offers subscribers not only a basic ‘variety’ package of some 75 channels but other extra pay channels such as Sky Sports 1,2 and 3 and the movie channel. New Delhi [India], November 17 ( ANI ): Rich Interaction Applications (RIAs) such as Google Hangouts, iMessage, and WhatsApp, as well as India-based applications such as Hike Messenger, JioChat Messenger, and Nimbuzz create a consumer surplus of USD 98 billion in India, equivalent to 4. In the case of tobacco control policy, standard cost-benefit analysis would equate the social cost of the policy to the real resource cost of implementation (enforcement and private compliance costs), plus the loss in the smokers' consumer surplus. Indeed, a recent review of research on productivity by the Brookings Institution and the Chumir Foundation confirmed that gains from new technologies are underestimated, owing to measurement issues relating to both product quality and consumer surplus. The study shows that the total estimated consumer surplus for mobile services and fixed broadband services was BD133 Million in 2008 and BD207 Million in 2014, which is an increase in consumer surplus of BD74 Million. Mohamed Bubashait noted that, Measurement of consumer surplus is essential for telecommunications regulators in this sector around the world, as they mainly aim to design and implement regulatory policies that increase consumer saving while promoting investment in new and innovative telecommunications services. Furthermore, BRG's analysis indicates that if there was only one mobile operator and no regulation, then there would be a loss of about A' to 2/3rds of consumer surplus, which means that consumers would be significantly worse off. 2) A problem with the estimation of consumer surplus is that the ATUS does not report on Internet usage as a separate category, with the exception of "household and personal e-mail and messages," which accounted for a trivial 0. And what about the consumer surplus and social welfare? While price discrimination may improve consumer surplus, for example, Utah Pie, this article will demonstrate other situations when price discrimination leads to both lower consumer surplus and overall deadweight losses to social welfare. We compare social welfare under each policy, where social welfare is defined as the sum of consumer surplus, the profits of the firms, and the environmental damage caused by the production with the dirtier technology plus any tax revenue minus the cost of any subsidy. The sizes of the consumer surplus effect and the profit destruction effect depend on the prevailing demand structure. On a per-capita basis in the 13-country sample, the average consumer surplus -- the perceived value that consumers themselves believe they receive over and above what they pay for devices, applications, services and access -- is about $4,000 a year, or seven times what consumers pay for devices and access.